Carpal tunnel syndrome can cause pain, numbness, and tingling in the hands. Patients may notice they have trouble fastening buttons or trouble with dropping things. They may also notice that they wake up at night with burning/tingling pain or wake up in the morning with worsening numbness. Patients frequently complain about having to “shake out” their hands at night to help with numbness and tingling. Treatment for carpal tunnel syndrome does not necessarily have to be surgical. There are successful, non-operative treatments such as bracing and cortisone injections that can help with night pain, in addition to numbness and tingling during certain activities. A significant percentage of patients can potentially be cured through non-operative treatment. Untreated carpal tunnel syndrome can result in permanent nerve deficits that include both sensory and muscle problems. It is hard to recover full sensation once nerve damage has progressed to an advanced stage. Motor or muscle problems may require complex surgery, such as tendon transfers, to restore function. It is important to make the time for a professional consultation if you have problems with numbness and tingling in your hands. Dr. Gluck and Dr. Vahey provide concierge VIP service at no extra charge. This includes direct access to your surgeon and closely supervised therapy. When surgery is necessary, their patients are treated with minimally invasive techniques that allow for early motion and return to work. Many times, skin sutures are not even necessary. Patients often notice immediate improvement in their symptoms the day after surgery for carpal tunnel syndrome. 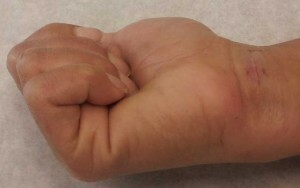 Pictured below is a patient from the Hand Center of Nevada less than 1 week out from endoscopic carpal tunnel release. Note the small incision at the wrist with skin glue, no sutures, and full finger motion.